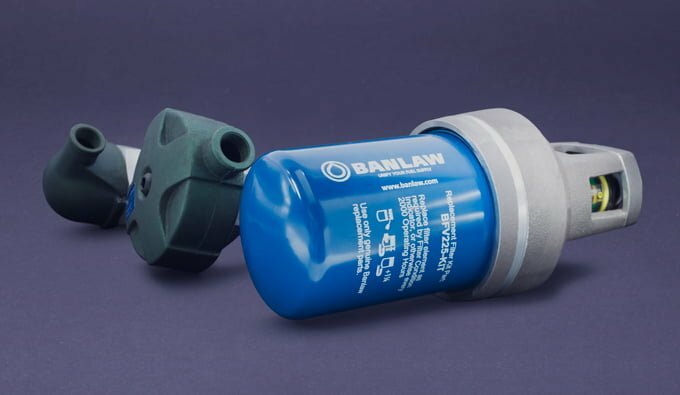 Banlaw has a range of robust diesel tank vents and tank breathers, built from high-grade materials for strength and durability to suit any operating conditions. Our diesel tank vent system provides overfill protection by determining the refuelling system’s shut off level. The vent mechanism seals the fuel tank when it is full, and prevents diesel spillage or leakage from the tank. The vents are designed to manage flow rates to complement the nozzle and the receiver setup. The small amount of pressure in the tank at shut off is dispersed and the tank is quickly returned to atmospheric pressure. Banlaw vents are available in unfiltered, filtered, and fine-filtered variants. A remote tank breather is also available. To protect your diesel fuel system from the damaging effects of airborne particle contamination, use a Banlaw filtered tank vent. Heavy equipment typically operates in dusty, dirty conditions and a generic Quick-Fill tank breather has no means of preventing airborne contamination entering a tank. The Banlaw Filtered Vent comes with a serviceable air filter. This filter protects against particles entering the tank via the vent, and thus entering the fuel system of the equipment. The service life of OEM fuel filters is extended, reducing the risk of blocked filters and equipment downtime.